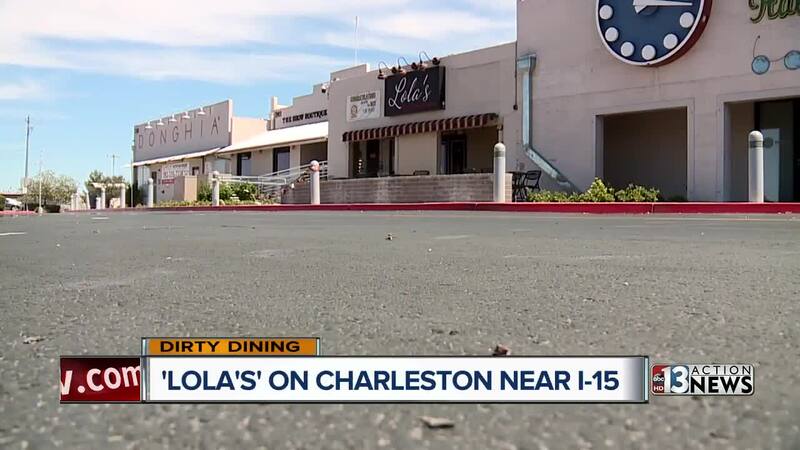 The banner outside and the photo inside with Chef Guy Fieri help show the celebrated past of Lola's -- A Louisiana Kitchen on Charleston Boulevard near Interstate 15. But the restaurant's May 14 health inspection tells a different story... One with 39 demerits and a C grade, which they kept until May 23 when they were back to a 6-demerit A. "Basically it was a plumbing problem and we've already rectified it," said Christopher, a manager who only gave us his first name. Water not being hot enough was a critical violation but it only accounted for five of Lola's 39 demerits. "If you give me a second I can get you my kitchen manager that would be able to help with that a little better," Christopher said. Chef Eddie, who also gave no last name, comes out but doesn't help explain the other violations. "So the only problem we had, it was, uh, the hot water and the water pressure." "I do understand that's one of the violations," Darcy Spears said. "It's just that that doesn't add up to 39 demerits. You've also got issues with food held past its shelf life, old food debris and dirt under equipment, flies in the facility, dirty ice machine... So that's stuff inside the kitchen and we're wondering if you felt that was accurate or unfair or just a wake-up call?" "I could tell you that's the major thing that we got -- for the hot water -- and that's all I could answer and no more comments, please," said Chef Eddie. Other violations included noodles that were nine and 10 days old; Jambalaya, raw shrimp, cooked greens and cut vegetables that were uncovered and subject to contamination; a dirty, rusty ice machine and a dirty can opener. There were also four imminent health hazard closures -- all for operating with no running water. Tony's Mexican restaurant on Jones and Lake Mead boulevards and Vegas Bakery in the same strip mall were both shut down May 18. Both re-opened May 21 with A grades. Four Seasons, also known as All Seasons Diner on Spring Mountain and Wynn roads is a Dirty Dining repeat offender. They and Diamond Bakery, also in Chinatown Plaza, were shut down May 15 for operating with no water. Both reopened with A grades later the same day. Erwin Arroyo, manager at Vegas Bakery, said they're taking action to improve training and make sure employees know when to self-close and how to recognize imminent health hazards so this does not happen again. He said this closure was sad for them as they're working hard to maintain a good reputation. No one from any of the other three restaurants returned our calls.